Plain old banana bread gets a makeover and, va-va-voom, Bourbon Banana Bread is in the house — extra moist and definitely decadent, but still welcome at the breakfast table. Sheesh. So anyway, that’s basically what I did… I even took it one further and added a bourbon glaze…just because. I can see why her bread was famous, bourbon adds that little something extra that makes a big difference. Despite all that I don’t really consider this a dessert, it’s more of a coffee break type treat. I think Mom would love this on her breakfast-in-bed tray, don’t you? This bread is moist and tender and all that you imagine it to be. I highly recommend giving it a try. By the way, if the combination of bourbon and banana is calling your name, you have to check out my BOURBON BANANA BUTTER! Instead of the glaze, you could try another approach with the bourbon…while the cake is still warm, poke little holes all over the top and drizzle on a tablespoon or two of bourbon and let it soak in. Just sayin’. Loaf pans vary in size, if yours is not standard, your bake time will likely be different. Tent with foil toward the end of baking if the bread is getting very brown. Lightly spray a standard 9x5 loaf pan and line with a piece of parchment paper with long ends so you can lift out the bread after baking. Cream the butter and sugar together until fluffy. Beat in the eggs one at a time, then the bourbon and vanilla bean paste. Toss the flour, baking soda and salt together. Blend the sour cream and mashed bananas together. Add the dry ingredients to the butter and sugar, alternately with the sour cream/banana mixture, beginning and ending with the dry. Blend just enough after each addition to combine, don't over mix. Turn the batter into the prepared pan and bake for about 50 minutes, or until fully risen and a toothpick inserted in the middle comes out without wet batter on it. To make the glaze, stir together the sugar and bourbon, adding a touch of milk or water to thin to glaze consistency. Pour or spread the glaze on the cooled cake. 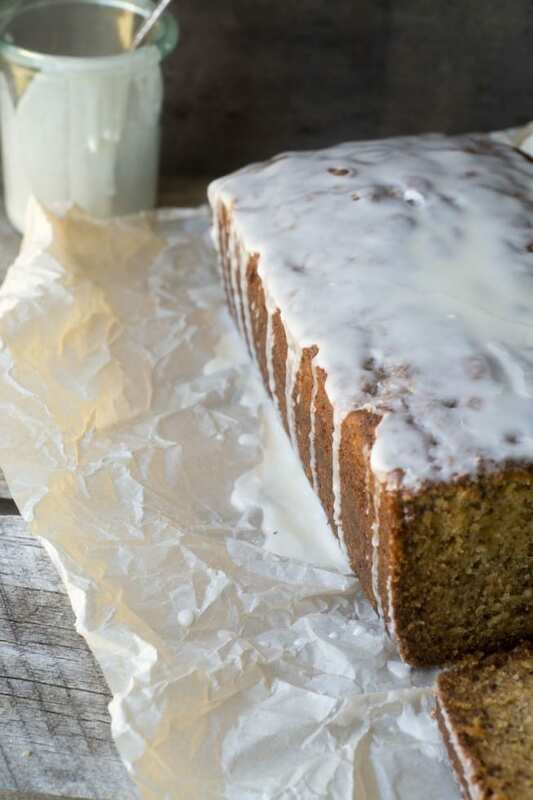 Don’t forget to pin this Bourbon Banana Bread! I just made this and it’s delicious! I was out of sugar (!!!) so I used brown sugar (only 3/4 cup). It’s super moist andonly took 45 minutes to bake for me. I used less bourbon in the glaze, half the powdered sugar and added sour cream to it to cut the sweetness. So good! 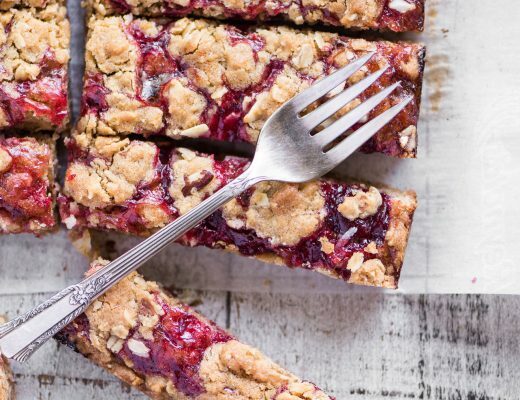 Can’t wait to try your recipes have you ever tried to make some recipes gluten free…..my husband and granddaughter have gluten issues….I can always try to bake both ways…..
Hi Lynn ~ yes, I do have quite a few gluten free recipes on the blog, and I plan to do more. I’ve found that when you use a good gf baking mix, like Bob’s Red Mill, for instance, that recipes can often be converted really easily. 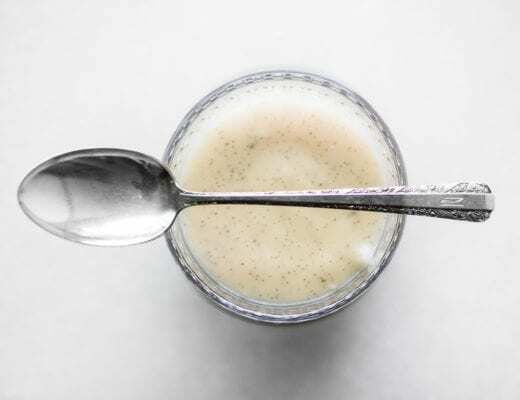 What is an appropriate substitute for vanilla bean paste? Vanilla extract is fine, Jennifer, use it to taste. I like a lot, so I’d use 2 teaspoons. I want this now, which is why I’ve saved it for so long! Trying it tomorrow! Thanks, Sue! Sounds wonderful – think Sailor Jerry’s (not Capt. Morgan) Spiced Rum would be great too! I made this and – OMG! Fantastic! The first time I made it I dialed way back on the bourbon in the glaze. The second time I went for it exactly as written. I definitely prefer less bourbon. I used 2 tsps. To me, the taste is more balanced and doesn’t over-power the fabulous bread. Okay, I made this recipe today and the bread was fantastic, but 4 tablespoons of bourbon to 1 cup of powdered sugar is NOT a good ratio for the glaze! WAY TOO MUCH bourbon! Maybe 4 TEASPOONS… I just thought it was over powering… And I like bourbon! Bourbon Banana Bread sounds great!! I would stop the lady in front of you too to get recipe. I don’t have to though, now I have it here. Thank you for sharing. 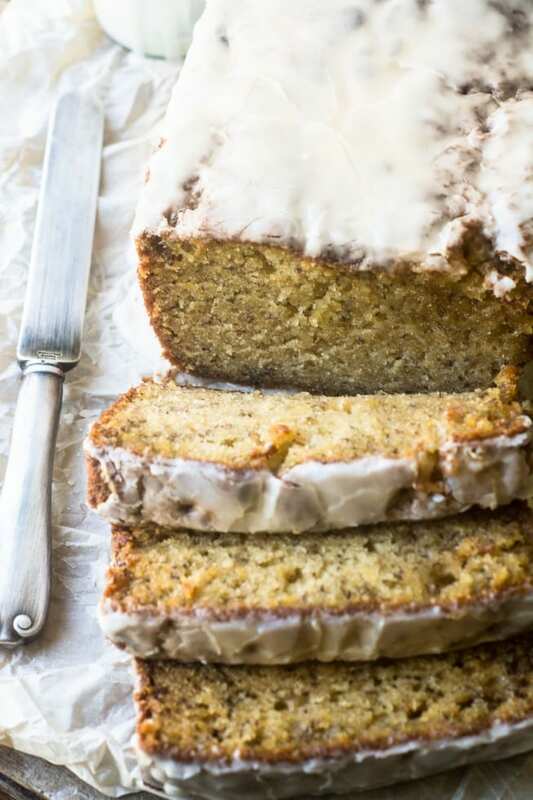 I love Banana bread and baking and have to try this soon. Raising my hand for a slice! This looks incredible, Sue! I love this twist on the classic, it’s amazing how a few little changes to a recipe can create something even better than the original! Hi Sue, I could definitely begin my days with a slice of this beautiful bread. Love that you added bourbon in the bread and the glaze. Very nice! ha! I love this story… the other shoppers must have thought she was mad but I love it… mind you, throw any booze into your favourite cake recipe is pretty much a wonderful idea so it’s a win-win from me! Sue, what a beautiful loaf! 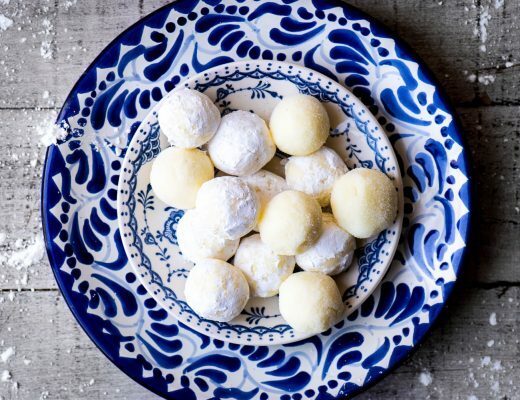 The glaze looks pretty and takes it right over into the dessert category for me — perfect with a cup of tea. 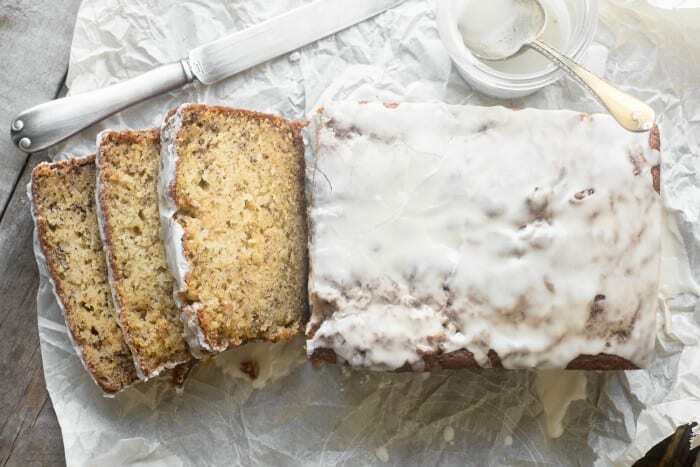 Yes please, I’m all for a thick slice of boozy banana bread! And I just had to share it on FB too :). 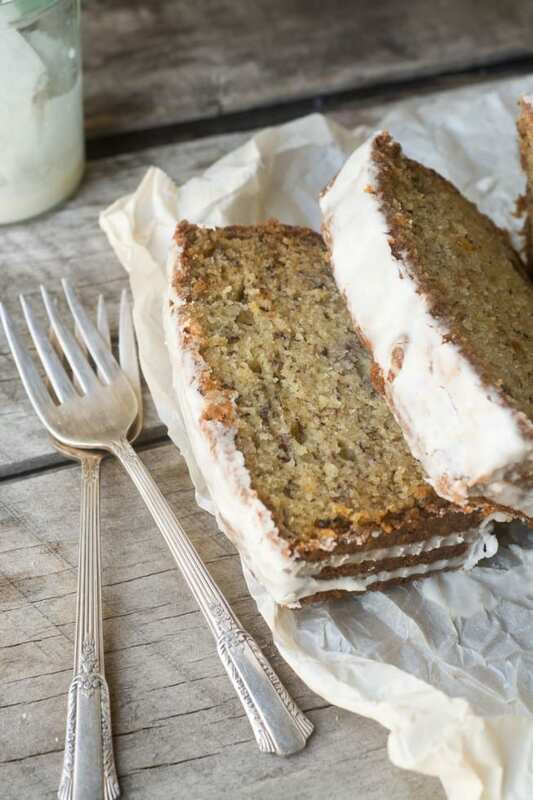 We love banana bread and this is a terrific flavor to spice it up! Genius! I am posting a banana bread recipe next. But if I had seen your addition of bourbon, I would have tried it. There are so many ways to take a simple recipe to the next level. Good job Sue. This looks amazing!!! I’m definitely going to make this this weekend!! Thanks! I don’t have bourbon..think we need some..I just made a Nantais cake..w/ hum..nice touch..the bourbon must be also! YES to bourbon!! I love cooking with fruits and alcohol, and can almost taste that banana bread!! I love how it came about too! I wish we were more chatty in the UK, I’d love to know what someone was making for a dinner party!! This just speaks to me! I put bourbon in everything from cocktails to marinades to desserts. Now it’s breakfast fodder! LOVE! Pinned! Yum, I love recipes that evolve like that! I think your friend at the supermarket would be quite proud of you Sue! Oh I really want to try this and I’m not even a drinker but I love banana cake and can imagine the flavours working so well as my mum used to fry bananas in brown sugar with whisky or was it rum!? Mmmmm that sounds so good! Me too, for sure Sarah. Let me know how it works for you if you try it. Oh my oh my. Yes please! The texture, color, icing, vanilla bean paste – all of it is absolutely stunning! Pinning and sharing!